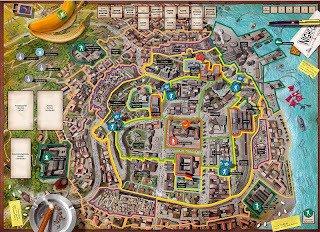 Each player is a representative of a corrupt and well-known family in a stereotypical "banana republic" (Republica de los Bananas) and tries to get as much money as possible (for his swiss bank account), when the yearly budget of the republic (consisting of foreign aid) is distributed between the players. The quality of the board and the other components (cards, tokens, little miniatures) is more than satisfying. Also the design reflects the satyrical point of the game pretty good and helps to create the right mood for the game, especially for the "revolt" part of the game - which is more or less a separate game in the game (for which the board is needed). Each game turn represents a year, where first of all a president is elected. The player being president is now responsible for setting up the cabinet - by assigning a cabinet position to each player. Afterwards he distributes the budget for this year to his Ministers and Generals, just as he likes to. Before everyone tries to transfer his money to his/her swiss bank account (where it is finally save), each player can try to assassinate another member of the cabinet (to get to own his/her money this way) - additionally players can try to revolt to elect a new president. This steps are repeated in each turn until the foreign aid is finally gone - then the player with the most money in his swiss bank account has won the game. This satyrical game is not only appealing because of its unique theme, also the gameplay is thought out very well - and guarantees hours of fun, especially if you play with people who know each other quite well. As a lot of bluffing and negotiating (and also some luck) is necessary to win, the game is exciting until the end - even if it lasts for a couple of hours. The game lenght of up to 240 minutes might be a slight disadvantage, which can be solved with some kind of house rule quite easily. Overall you should definitely try to become president in Republica de los Bananas and save a few million pesos for your retirement. REVOLUTION! The Admiral didn't go to the bank, and someone else was elected El Presidente. As a loyal citizen, you order your Air Force to defend la Republica (and your power base) from another corrupt regime. As the planes fly overhead and the tanks rumble from the barracks, the coup is on! Will you triumph to become the new El Presidente for Life? Or will you be sent to the firing squad? 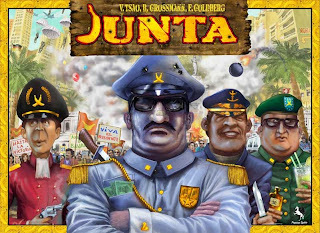 Junta is the game of power, intrigue, money and revolution in an all too familiar banana republic. In this multi-player game, the players, as the ruling families of la Republica, connive, cajole, threaten and ally their way to the fattest Swiss bank account.